Myntra.com is offering Flat 51% off on huge collection. They have Shirts, Trousers, T-shirts, Shoes etc. Just follow the steps below to avail this huge off. How to get Flat 51% Off on Myntra Sale? Select Product from variety of available products. Note: Cash on Delivery is also available. Homeshop18 is offering latest non-fiction novel of bestselling novelist Chetan Bhagat named "What Young India Wants" at Rs 98 but you can get additional Rs.50 off using the below mentioned coupon code. 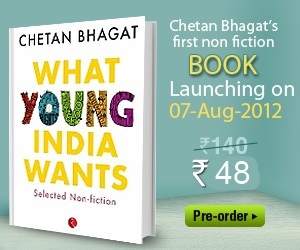 How to get Chetan Bhagat's - "What Young India Wants" Novel at Rs 48? Note:Its a pre-release as the book is going to release on 9th Aug so the delivery will be done from 9th aug onwards. Pepperfry is offering Clifton's Churidars at just Rs 299. They have many option to choose. Follow the below steps to grab it before out of stock. You can return this item within 30 days from the date of Invoice.You will need to ensure that the item reaches us safely, intact with all its seals and trappings (boxes, bags, tags, stickers etc.). Please retain a copy of the invoice and send the original invoice with the item. How to get Churidars at just Rs 299? Note: You can also Pay Cash on Delivery!